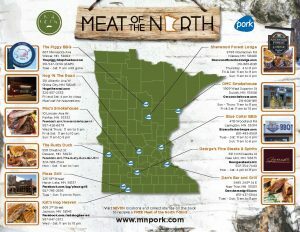 Explore the great state of Minnesota with your map to delicious pork! Minnesota’s pig farmers are committed to raising healthy pigs and providing delicious pork for you, your family, and all Minnesotans. The tasty pork you will find at each of these eleven locations is provided by the amazing chefs who embrace the Meat of the North: Pork. Click here to download your Meat of the North Passport. Here’s how you complete the Pork Passport! If you have questions about the Meat of the North or would like more information about participating in the program, contact Pam Voelkel, director of promotions and events for Minnesota pork at 507-345-8814 or pam@mnpork.com.